Big Announcement: Designer House Project! I have my work cut out for me over the next couple of months! I’m so excited about my space and am totally obsessed with making plans! 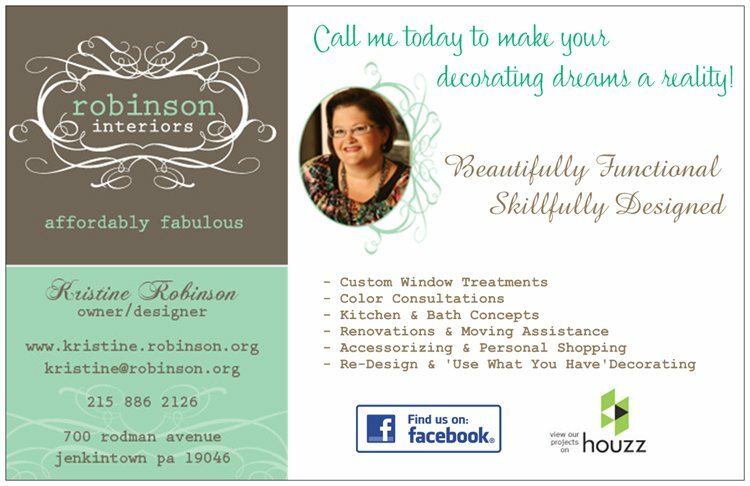 I’m very pleased to announce that Robinson Interiors has been awarded an amazing room in the Bucks County Designer House this spring. I’m extremely excited to be making plans for enhancing the absolutely stunning Sunroom on the main floor of this lovely home! My room is the lovely sunroom seen at the bottom left of the home in this photograph. In addition to the interior renovations, the gardens will be transformed during the designer house and will be a feature of the tour as well. 2014 marks the 39th annual Bucks County Designer house and this year’s home, called Serendipity Farm, will not disappoint. It is a 245-year-old farmhouse nestled on nine acres with spectacular views and all the charm of historic Bucks County, located just outside of Philadelphia. The property includes a charming old farmhouse, a cozy cottage, and a grand barn. Serendipity Farm as seen from Above, with its beautiful barn, cottage, and pond. The grounds are amazing at this year’s property! As many of you know, this designer house is a benefit to support the V.I.A (Village Improvement Association) which funds the Doylestown Hospital. For more than 35 years, the Bucks County Designer House & Gardens has been the largest fundraiser operated by the VIA. This annual event now attracts more than 7,000 visitors each year. Feel free to browse the designer house website for more information on this fantastic event, which is open to the public from April 27 – May 31. I have my work cut out for me over the next couple of months! I’m so excited about my space and am totally obsessed with making plans! I’ve already made several design-related decisions, like using lots of vintage items and keeping the gray-stained walls intact. One of the hardest things about doing a designer house room (and for homeowners who are decorating, as well) is narrowing down your choices and focusing on a direction. I promise I’ll share my ideas, floor-plans, and images of the items I intend to use in future posts! Until then, thanks for reading and please tell everyone about Kristine Robinson’s Blog. I need all the friends I can get! This entry was posted in Benefit, Bucks County, Charity, Decor, Decorating, Designer House, Farm, Gardens, Home, Home Decor, Interior Design, Pennsylvania, Renovation, Uncategorized and tagged Award, Bucks County, Decor, Decorating, Designer House, Farm, Gardens, Interior Design, Sunroom. Bookmark the permalink.